I was squatting down in my front yard as I do every morning, picking veggies for breakfast, when I heard a voice behind me. I stood up and turned around. It was a neighbor from across the street and three houses down. “They’re peas,” I told him. A few years back, we were among the first in our neighborhood to rip out the grass in our parkway so we could plant drought-tolerant succulents and other cool-looking plants instead of boring, old, water-sucking grass. Little did I know that, along with saving money and water, the process also attracted the curiosity of lots of people on our street. We were bucking the trend, breaking the norm, doing something different. And people wanted to hear all about our new way-cooler-looking-than-grass plants. Then we created a vegetable garden in the front yard. The goal was to have a cool modern-looking yard and have some fun growing and eating good food. We succeeded in harvesting enough kale, tomatoes, artichokes, chard and peas to feast on for many weeks (and I was able to include my own home-grown items in the yummy edible NASA satellite models I made). But our gardening exploits brought us another unexpected advantage. We were already growing food in our backyard and side yard, but we learned that when you plant cool stuff in the front yard, lots of passersby stop to check it out. It’s usually the artichokes that evoke the most frequent comments and questions. I mean, artichokes are weird-looking. (Shhh, don’t you dare tell them I said that!) But over the years our vegetable garden has become a magnet that’s attracted friendship and community in our neighborhood. And we’ve seen many other lawns turn into gardens, too. There’s no way to tell what will unfold when you start to do something, even the smallest thing. Actions grow and expand, sort of like the way our peas started out small, crawled past their trellises and are now getting tangled up into each other. What you create in the world can take on a life of its own, beyond what you might ever imagine. Every Earth Day I write about taking an individual action, and every time I write this I get all kinds of criticism about how doing one small thing isn’t enough. But next time you start to think that your actions are too small to make a difference, think about me and my silly old peas. Remember that I reached down, picked a fresh pea and handed it across the stucco wall to the guy who lives down the street—the guy whom I hadn’t yet connected with in all these years; one of the last of my neighbors to reach out. He told me that he and his wife saw our yard and decided to plant a garden as well. And while you’re at it, remember to celebrate Earth Day this year by joining NASA as we all share views of our favorite place on Earth on social media. We hope that if all of us take a moment to acknowledge and remember our planet, we'll feel more connected to it. You can post photos, Vines and/or Instagram videos. Just be sure to include the hashtag #NoPlaceLikeHome – no matter what social media platform you’re using. 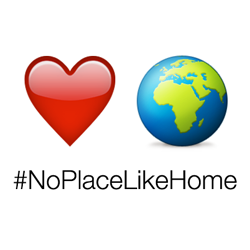 You can also get on board now by using our #NoPlaceLikeHome emoji as your profile pic. Join the Facebook or Google+ events and invite your friends to participate. Pledge to spend one day celebrating the planet that over 7 billion people call home. Find out more at http://www.nasa.gov/likehome/. Thanks for everything you do to care for our planet.